Bugtown is full of amazing oddities. The inhabitants ability to travel between reality levels is one. Another is the career of THE BULLDAGGERS, Bugtowns premiere insect-rock group. No place is safe from their sonic pursuits. SAVAGE HENRY is the bands guitarist. ASH RA TEMPEL: Caroline: Circles vs Squares. DAVID BORDEN (from Mother Mallard): 2, 5. MICHAEL CHOCHOLAK: 17, 18, 19. FOETUS (aka Clint Ruin): 23. MANUEL GOTTSCHING: Caroline: Circles vs Squares. PETER GULCH (from Nightcrawlers): 20. THE HOOD: 9, 10, 11. BARNEY JONES (from Mars Everywhere): 18, 19. DAVID MYERS (aka Arcane Device): 18--22. NASH THE SLASH: 2--7, & The Contaminated Zone 3. RICHARD PINHAS (aka Heldon): Vol.2 #3. THE RESIDENTS: 2, 5, 6, 18, 19, 20, The Contaminated Zone 3, & Stalking Ralph. CONRAD SCHNITZLER (from Tangerine Dream, Kluster): 1, 2, 3, 4, 7, 8, 9, 10, 11, 12, 13, 16, 23, 24, 28, 29, 30; Vol.2 #1, 3; Post Bros 2, 5, 42, 48, 50, 63 (with cameos in 7, 16, 41); Post Bros Annual 1, 2 (with cameo in 3); UBERDUB; the two CON & CTHULU books; (a cameo in Caroline: Circles vs Squares); and Data Core 1998. KLAUS SCHULZE: 27, Caroline: Circles vs Squares. CHUCK VAN ZYL (from Xisle): 20. ANDREW WEISS (from Scornflakes, Gone, Henry Rollins Band): 2--7, 16. The WHACOs are out to punish UK artrock band WIRE for their unbridled creativity, but Savage Henry comes to the rescue. Black & White interior, with full color cover by Matt Howarth. Requires Acrobat Reader 5 or higher. search for the Awesome Cravat. And Savage Henry and Nash the Slash perform a special dream concert. An all new 3 issue comicbook Bugtown series with musician guest stars! discover an antique shortwave receiver that ends up summoning an alien invasion. Can they stop these Loud Ones? Loud Ones. Also appearing: Conrad Schnitzler. recordings. Joining them in the fight: RON GEESIN. An all new one-shot Bugtown comicbook! by a vampire who turns the entire audience into puppets. A Digital Collection of the rare serial from the 80s. Conrad Schnitzler wants to do a Thousand Cassette Concert, but before the Lord C'Thulu can help, Con gets sucked inside his own computer and comes face-to-face with his digital counterpart. Black & White by Matt Howarth. SAVAGE HENRY and LOOP GURU in an exciting graphic novel. When a member of the world beat/techno group LOOP GURU gets abducted by a mysterious lightning bolt, the band set out to rescue him--only to find their world slipping into a prehistoric nightmare. Can interdimensional hero SAVAGE HENRY help them out and set the world right? and restore the node before all of reality goes awry? Besides full color fold-out cover art by Howarth, this album release contains a 16 page B&W printed booklet featuring an exciting comic strip by Howarth, while the CD offers 70 minutes of spacey soundtrack music by Quarkspace. Unlike anything you’ve ever seen! A unique multimedia collaboration, this double CD features over 2 hours of cosmic soundtrack for a 16 page full color comic by MATT HOWARTH (which comes as a PDF file on disc 1 and is playable on any computer). Entire package features cover art by Howarth, too. 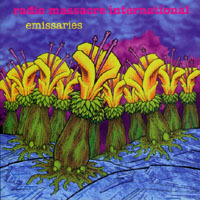 RADIO MASSACRE INTERNATIONAL are considered one of the greats of the current spacemusic/electronic music scene. chilling tale of despair and redemption. Canadian rocker Nash the Slash has a quandry: how can he do two concerts that are scheduled at the same time? The solution: a robot duplicate of himself! 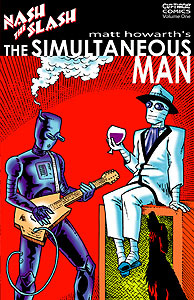 Watch as Robo-Nash joins the HairyMania Reunion Tour--meanwhile Nash and his daring devil hound, Digger, travel to farflung Tibet to perform a special concert for the Monks of Mount Mysterio who have unearthly ulterior motives. Includes a CD with music and Nash narrating the story. These digital novels are in PDF format, and shoudl be easily readable in both Mac and PC computers via Adobe Acrobat 3.1 or higher. Adobe Acrobat is freely distributed among various systems, or can be downloaded for free from Adobe's WebSite (http://www.adobe.com/acrobat). On-line orders can avoid shipping charges by accepting delivery of the novels as downloadable e-mail attachments. Three Bugtown tales: two twisted shorts and one extremely demented short novel. 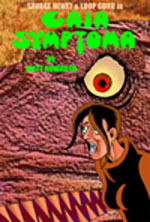 See what happens to Los Angeles when the Post Bros tangle with a villainous voodoo cult in "L.A. Differential." See how Savage Henry and ambient musician STEVE ROACH spend an afternoon finding life in a supposedly barren landscape in "Sporadic Motion" (includes a piece of full color art. And experience the completely outrageous "what if" revisionism that ensues when a wish gets granted in Bugtown, and Ron Post and Hiroshima never became lovers and have continued their reality-shattering war for the last two decades, making Bugtown even more dangerous than ever...in "Nucular Reconstructive." A total of 165 pages. Afterburn is a pirate radio station struggling to entertain and reunite the post-holocaust human survivors in a savage wasteland full of mutants and crazies. When a Quiet Man attack wipes out their Tribe, a group of orphaned youths embark on a pilgrimage in search of the elusive pirate radio station. Along the way they will encounter a mysterious prairie traveler and his opinionated two-headed cat...and adventure, monsters, romance, and deadly threats. TUNERS is intended for mature audiences. TUNERS is 226 pages long (or roughly 98,000 words, depending on how you want to consider it). This novel includes a bonus file: a single piece of B&W art by Howarth, featuring portraits of the tale's main characters. A total of 226 pages. To arrange the purchase of the items you've checked, fill in the form below. Matt will respond via Email to confirm your order and give you a total and instructions. Include 4.50 (per order, not per item) for shipping. Outside the USA, airmail estimate will be included in Matt's response to your order. Some of the items are pay downloads. You click the links and pay Paypal, then you receive instructions where to download your purchase. You can pay via check or money order. You can also pay via PayPal--just say you’d like to pay via Paypal in the Remarks box and Matt will send you instructions when he responds to your order. (International M.O. in USA funds on orders outside the USA). You must be over 18 years of age to order most items. There is no minimum order. Inquiries and comments are welcomed. If you would like items in your order to be autographed by Matt, all you have to do is ask. To reserve more than one copy of an item, just list the title, issue # (if applicable) and the number of copies in the Comments or Questions? box below. Thanks! I would like to receive the Matt Howarth email newsletter, too.